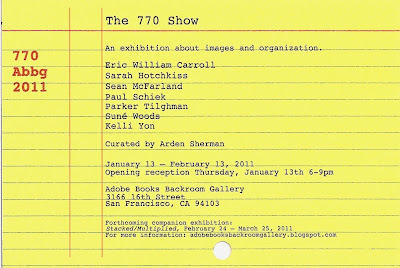 Adobe Books Backroom Gallery is pleased to announce its 2011 inaugural exhibition, guest curated by Arden Sherman. 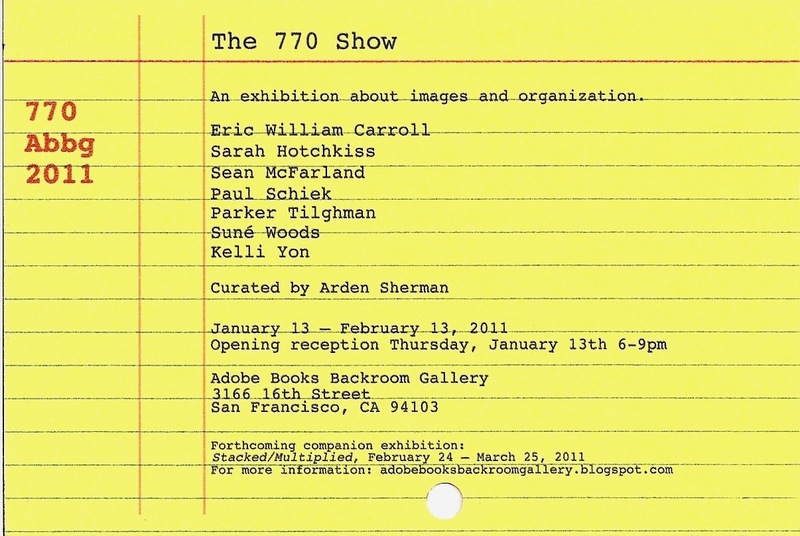 The 770 Show is the first in a two-part series dealing with the site of the bookshop itself — as inspiration, illumination, and artistic material. For the first installment of the series, The 770 Show, seven artists were invited to spend time in the bookshop stacks, discovering the wealth of ideas that present themselves when organization does not follow tradition. From the huge quantity of subject matter on hand at Adobe, each artist selected a singular image found in a book and responded to this image through photography. Both the book image and the photograph are on display in the Backroom Gallery. In his short story "The Library of Babel," Argentine author (and librarian) Jorge Luis Borges wrote that if one looks at the repetition of disorder long enough, what was originally perceived as chaos eventually becomes the order of things. 770 is the number for Photography and Photographs within the Dewey Decimal System, the system of classification used in most libraries. At Adobe Books, the organizational system is loose at best, and sections often blend and overlap. The Adobe system, akin to that of The Warburg Institute or the San Francisco-based Prelinger Library, is predicated on the notion that the significance of every book depends on its context within the library and its neighborhood on the shelf—a notable departure from the system of John Dewey. The artists in The 770 Show take up the complicated idea of order and organization through the simple act of selection and interpretation. Their response through photography further contest traditional ideas of order since the medium of photography is, by definition, temporal and variant. The 770 Show encourages exploration in the bookshop stacks and allows the visitor to make connections among the varied subjects and, like the exhibition artists, encounter unexpected treasures. Artists in the exhibition include Eric William Carroll, Sarah Hotchkiss, Sean McFarland, Paul Schiek, Parker Tilghman, Suné Woods, and Kelli Yon. Exhibition dates are from January 13 - February 13, 2011.